THE FUTURE OF stock car racing hangs tenaciously on a thread. Manufacturers and racers alike must come to grips with the reality of the energy crisis and the ever increasing crisis of escalating racing costs. To believe that more dollars can come from the stands to pay for higher car costs is as unrealistic as to believe that racing can smugly confront the energy crisis by doing nothing. 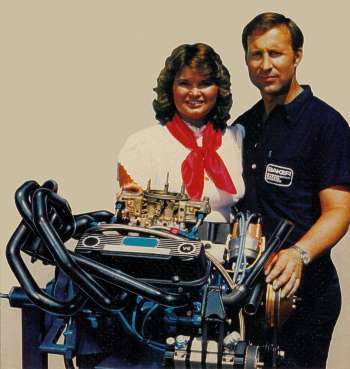 Ray and Linda Baker of Baker Engi­neered Engines in Grand Rapids, Michigan prefer to think of themselves as people with foresight. Perhaps they are more properly seen as people with guts. They have elected to spend thousands of hours away from the most victorious short track engine business in racing history to try something completely different. If they are successful, they will help answer the critics of racing's use of fuel while cutting the cost of the sport by 20-25%. Their plan hangs by four bolts to a blue engine stand in an immaculate shop. It's a Buick V-6. The Bakers believe that a V-6 can be practically run in lighter-than-now cars with the speed of a Chevy V-8 but for far less money. "Everything is smaller," says Ray Baker "There is less chassis, the car is lighter so there's less to build. Less weight means the tires last longer. The fact that there are six cylinders cuts fuel costs. I'm tired of S10T000 engines and this one has some hope." Baker thinks the Buick will cut the cost of racing 20-25%. 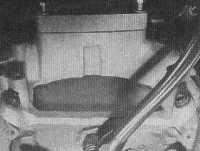 Baker installed one of his V-6 engines in a Ray DUIon chassis, put Mark Martin be­hind the wheel at New Smyrna in February and discovered ". . . he would have been one of the top qualifiers if it'd been an ac­tual race. Mark ran 70 laps on qualifying tires and hardly heated them up," he said. Does Ray Baker see the Buick V-6 as the performance engine of the future? 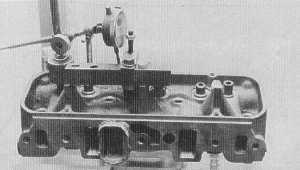 Baker's modification of the stock Weiand can be seen in the top and third from thop photo. The other two show the stock unit BB (Before Baker). And what about the old reliable Chevy V-8? "It'll be around for some years yet. We don't want the Buick to go out there and knock it right off. We'll offer the V-6 for sale in 1981 and by 1982 I think there will be a lot of them," he says. Baker thinks it would hurt racing to stick Chevy owners with obsolete motors. "There'll come a time," says Baker, "when car owners will just say to themselves, 'should the next one be a Chevy V-8 or a Buick V-6?' and they'll decide on the Buick." The ASA, which appears to be the locus of technological development in Camaro racing, already has rules which permit greater engine set-back with a V-6 than a V-8 and the V-6 can be run a lighter chassis than the V-8. In the past, other associa­tions have followed what the ASA has done since the ASA draws the biggest stars Baker thinks such will be the case here. As far away as Massachusetts, a V-6 Buick can even be turbo-charged to run against V-8s at Seekonk Speedway where track operator D. Anthony Venditti, a Promoter of the\Year, has sought to encourage V-6 engines at his track. Baker feels that the leaders are with the program and that the rest are sure to follow. Also pointing in the direction of the Buick V-6 as the emerging engine are two other factors, one obvious and one subtle but terribly important. The obvious indica­tion is from Detroit. The days of V-8 engine production are numbered. Certainly stock car people can continue to run a product long after Detroit has stopped producing it as was the case with the straight axle front end. However, when parts become scarce their cost rises and racers being to look for alternatives. The non-obvious factor has to do with Japan. There was a time when Detroit was associated with fun cars, automobiles that spelled excitement. When small foreign cars first came along, Detroit produced an awful array of tin cans to com­pete with them. The cars were small which was O.K. But they were underpowered, looked like Grandma's cup of tea. fell apart, and were uninspiring. The small cars from Motor City were hardly competition for the free spirited youth oriented American buyer who bought the Toyota Celica, Datsun 280ZX, Mazda RX7, VW Scirocco, Porsche, and others. While foreign equipment was soaking up the market (imports now account for nearly 30% of all US car sales), some of the sharpies in Michigan looked out their windows and realized something was wrong. Indeed, at one re­cent Michigan conference on how to stem the tide of rising imports, the parking lot used by delegates contained 18% foreign cars. Buick saw it first and they have the jump now. They aren't in racing but they sure are putting out parts that are compatible with it. Their approach has been very similar to that of Chevrolet when Zora Arkus Duntov rang the performance bell and led Chevys to young men's garages from sea to shin­ing sea. Not only was Chevrolet successful sell­ing complete cars with their performance image, they also sold a few parts. The num­ber of blocks, cranks, heads, and distribu­tors that have crossed the parts counters at Chevrolet Dealers that have wound up in stock cars cannot have gone unnoticed. Some of those parts, after all, were never manufactured to see a new car showroom and yet have helped, for years, the econ­omy of America's largest car manufacturer. Chevy wasn't first. Ford did the same thing to sell flatheads and it worked for 20 years. Buick s new line for 1981 is sharp. It isdecidedly performance. It means to com­pete with the imports for the youth per­formance market. So when they set out to build a V-6. nobody was there to say. "Hey, someone might race this thing and ruin our image. Let's build a motor for it that can't be raced." Nothing could help Detroit more than to have quick stuff that looks sharp and runs well. Baker was even able to get his valve cover on the motor. Crane rockers ride on a solid shaft. The game plan for Ray Baker is an am­bitious one. He is planning to be the U. S. capital of Buick V-6 racing engines, the marketer of components and complete race engines. Baker's emphasis will be on components. By 1981, Baker Engine will be able to supply all of the heavy duty parts that are needed for racing. "If we have to stock 100 blocks at all times, that's OK," says Linda Baker. "We are absolutely into this thing and we plan to stock everything from a single bolt to a complete engine. Allot it forthe Buick V-6." Why Buick? Why not Chevrolet? "Buick was there first and they are way ahead of Chevy," says Baker. Smokey Yunick had his hands on Buick V-6 parts three years ago and did a con­siderable amount of development work on them. Yunick's R & D put the engineering into the Buick V-6 that made parts tough enough and quick enough to run all day up front on the race track. Chevy is just getting started on their program. The valves in place look mighty big for the combustion chamber. 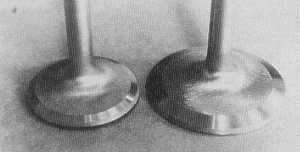 The V-6 valve on the left contrasts with the Chevy valve on the right. These are intakes. Like all his engines, Baker uses the align hone. But look at his main bearing girdle! The half round that Baker puts on the rocker studs can be clearly seen here. Baker gets oil pressure from the back of the block and scavenges from the oil gallery. 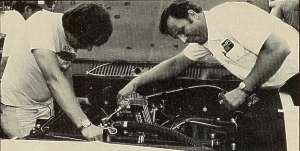 Ray Baker's engines have won more stock car races than any other of the 70's. Baker is heading into a new world that he feels will cut the cost of racing while improving the sport's public image. Yunick has done so much work on the engine that major aftermarket companies like Moroso already offer a considerable Buick V-6 line in their catalogs. Baker him­self is preparing a Buick V-6 catalog which will offer all components of a complete engine. Companies like Crane are also building Buick V-6 parts for the valve train. Weiand and Holley both have intakes thaf fit Buick V-6 engines and that means the Buick aftermarket ball is well under way. There is a considerable amount of catching up to do for the Chevy V-6 and it may al­ready be too late to get it together. After all, when Chrysler put a tremendous engineer­ing and dollar effort into the Direct Con­nection program, they never came close to anything resembling a market share in performance. Chevy was there first. In a capsule: Buick built the parts, Yunick did the R&D, and Baker is doing the mar­keting. Only Baker can be properly con­sidered into racing and Buick refers calls made to the factory with reference to rac­ing Buicks to Baker Engine. 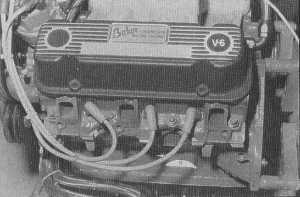 Baker has been involved with the V-6 for over one year. He spent two weeks at Yunick's where Smokey shared the result of his R&D work. The two continue to com­municate freely with each other. The splayed crank journals can be seen in this shot. A Yunick Y inlet feeds the water in. Weaver Bros. dry sump unit is bolted on nicely. Scavange from the old gallery is very close to the intake face. Just as we went to press, Baker's engine had been tested in a Dillon chassis with Darrell Waltrip behind the wheel. The engine performed well although it did loose a head gasket. The car ran at the mile at Milwaukee and on the half at Indianapolis Raceway Park been with sports car racer Pete Harrison who runs the IMSA circuit. Baker is such a public figure that he has preferred to work where he is a bit less known than at an oval track. "Pete's a lot like Bob Senneker," says Baker. "Nothing rattles him. He just goes out and runs fast. And he knows what he's doing." Harrison has run over 600 competitive miles with a Baker Buick V-6 under his hood and has become faster and faster until, now, he is running nose to nose with the 366 CID engines in one mile long sports car chutes. "He's a threatening force says Baker, "And they certainly know the Buick V-6 is alive and running." There's a lot for oval track racers to like about the Buick V-6. In particular, they are certain to appreciate Buick's over-the-counter prices that are less than aftermarket prices. Many of the engine's most vital components will in fact be available over the counter in heavy duty configuration. The basic lay-out of the block is compatible with racing. Unlike the 60° V-6 en­gines, the cylinder walls in the Buick are 90°. This means that the pistons run up and down in something that's a lot closer to flat. It also means that there is plenty of room for a substantial intake manifold. "Don't forget, an engine's nothing more than an air pump," says Baker. "You've got to get air into it and you've got to get air out efficiently. So that space between the intake runners of the heads is extremely important." 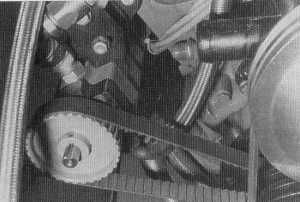 Baker's Buick engines use a Weiand in­take manifold. He admits he puts over thirty hours into each although it is Baker's understanding that Weiand has a new per­formance manifold that will eliminate most of this work. The original Weiand unit is for passenger car application. EGR stuff is all over it and radiator water passes through it. Baker cuts lots of the manifold off and then welds a flat aluminum plate beneath the in­take runners to keep them completely ex­posed to open air. Internal modifications are limited to cleaning the manifold and port matching. It's a great deal of effort but the results in terms of torque and horse­power are rewarding. The heads "flow just super," says Baker. "I couldn't believe it," he goes on, "but they flow just as well as a small block Chevy. The head ports and intake are a big, big story. Get them right and then all you have to worry about is longevity." Yunick figured out the initial grinding procedures for the cylinder heads in his R&D effort and that work is the key to the success Baker has enjoyed in his shop. 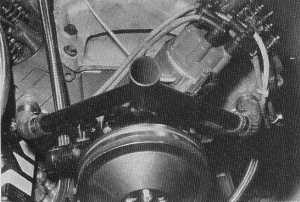 Although there are only four bolt holes surrounding each cylinder. Baker has dis­covered that using studs as opposed to bolts in the four holes and surfacing the deck and head face eliminates head gasket problems without 0 rings. 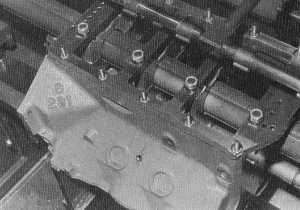 The small block Chevy has five bolts per hole. The bottom end of the Buick needs some help and Baker has built a girdle that runs over the bottom of the main caps that puts between .002 and .003 of pressure on those caps. He is in the process of designing Buick fitting cross drilled four bolt caps. The girdle is mounted tothe block and each main cap is torqued through it. According to Baker, the girdle is absolutely necessary terracing purposes. The most time consuming problem is re­lated to oiling. The Buick comes with a bulky external oil pump and Baker had to remove it and then cut material from the block. He in­stalled a four stage dry sump system on the right side of the engine in a configuration not unlike that seen on small block Chevys but with two pan and one oil galley pick­ups. He drilled out the oil passage on the front of the block that originally fed the oil pressure gauge and ran the pressure side of the pump into the enlarged hole. A new oil pressure spot was needed and one in the rear of the engine near the camshaft was selected. An appropriate fitting was installed in an existing hole that otherwise would have been plugged there. Baker used external plumbing on the right side of the engine running to mains #2 and #3 to insure sufficient lubrication. In order to effect the modification, preci­sion drilling was necessary and Baker strongly recommends against back yard builders trying the process as a mistake of only thousandths of an inch will ruin the block. Baker cut down Chevy valves and used his functionally efficient three face grind in the Buick. 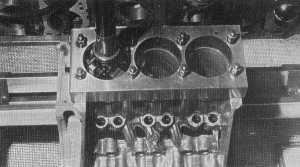 There is a considerable reduction in valve head size in the Buick vs the Chevy head as can be seen from the accompanying photography. Crane Cams is making an impressive col­lection of valve train equipment including mechanical, mushroom, hydraulic, and roller cams, special racing lifters that are compatible with the above cams, push rods, valve springs, and the nice inexpen­sive needle bearing roller rockers that have stolen the show in stock car racing. 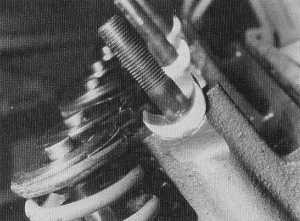 Baker went Crane throughout the valve train but found that for his taste it was necessary to raise the rocker shafts a bit. He machined spacers to accomplish the task. 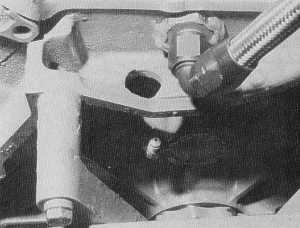 The Buick rockers run on a shaft as do Fords and not on a single stud per rocker as is the case in both large and small block Chevys so no stud girdle is needed. The crankshaft in the Baker Buick is a turbo V-6 that is available over the counter. Unfortunately, this crank is cast iron which is not anyone's first choice for racing. However, Buick is said to be producing a forged crank which will surely become the favor­ite over the counter item. 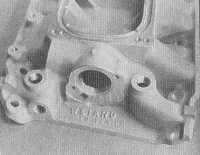 It is also known that several companies are contemplating billet cranks and if the engine becomes as popular as Baker expects, they are certain to be manufactured. 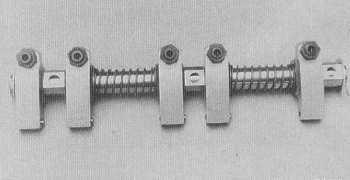 The crankshaft is very unusual in that the rod journals are splayed or separated one from the other. Best look at the accompanying photography to see what it looks like because it's markedly different than anything that ever came out of the factories to date. In order for the crank to stay together, Baker rolls small grooves on the outside edge of each rod journal, a procedure that he finds absolutely essential. So critical is it that the groove cannot be ground or cut in order to work, it abso­lutely must be rolled. 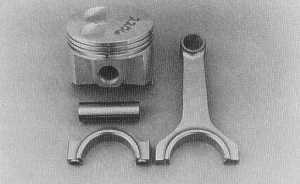 Baker's IMSA engine uses Carillo rods and Grower is known to be interested in producing a racing strength connecting rod. Baker uses a Chevrolet pin of his own design and manufacture. The pistons in the Baker come from Diamond Products which reworks a TRW forging. As with the small block Baker Chevy, the rings in Baker's Buick are Speed Pro moly (not Dyke) rings. The carburetor that works well is the 600 CFM Holley which Baker tricks up in ex­actly the same manner as his proven 750 that is popular on small block Chevy engines. The headers, however, are all Baker. He has run all six primary pipes into a single four inch wide collector that produces what he calls "... a really unusual sound. At idle it sounds scattered, something like an AA fueler on the line. But when it's racing, it has a completely different sound than any­thing else. The only way I can describe it is to say that it rips, sort of like the sound you'd hear if somebody tore a hugh phone book in half. It's different but it definitely sounds like a racing engine." The primaries are 1 1/2 inches now but Baker will soon be experimenting with 1 5/8 inch pipes. Baker's choice of ignition is either the Mallory orAccel BEI distributor. 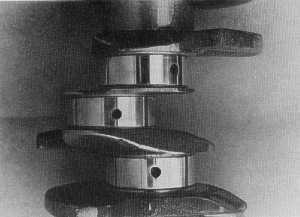 Since Baker's Buick is internally bal­anced, the harmonic balancer, a stock Buick part, is cut down. Pulleys that run the stock aluminum Buick water pump are available and can be purchased through Baker. Baker makes his own dry sump oil pan that's full of baffles similar to a small block Chevy pan. However, a wet sump pan that is a bolt on designed for both oval and road racing applications, is also available. Water enters the engine through a Yunick Y inlet, going directly into the heads. The back end of the engine is Baker's slickest move. He's tricked up a special bellhousing so that it fits either the Buick OR Chevy V-8. Thus, once in place, either the Buick or the mouse could be installed with no changes other than the engine itself. 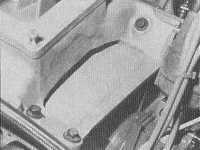 Since Baker designed the front mo­tor mounts to reach forward and hook into the stock Chevy position, the same car could be used for either powerplant. Baker's Buick is also compatible with Chevy and Chrysler flywheel/starter/ clutch assemblies and all that's needed is for the mechanic to elongate one bolt hole in the flywheel to use all the Chevy com­ponents he already has. There'a s lot of Chevy in this Buick and in many, many ways the parallels between what racers run now and the Buick are al­most perfect. Yet, unlike the small block Chevy, Baker has secrets in his V-6 that he declined to reveal. "Smokey put a lot of time into re­searching this engine. I've spent a lot of time—over two thousand hours—working on it myself," he says. "They'll catch on quick enough to what has been done here so we'll keep a little in the can for a while at least." Yet Baker's biggest Chevy secret—that of component matching and careful machine work to improve durability is also present in his Buick. There is no astronomical compression here, no radical camming, no strange arrangement for the valves, and no incredible bore or stroke. The engine is remarkably close to where Buick intended it to be for the street. "It's the performance engine of the fu­ture," says Linda Baker. "They made things heavy duty, reasonably priced with good accessibility. That's what made Chevy the performance engine of the 60's and 70's and it's what we think will make the Buick not only the performance engine but also the racing engine of the 80's." The Bakers are into the Buick with both feet. They believe in what they are doing and their track record to date has been per­fect. However, their distinct emphasis will be on providing components rather than complete engines since all engines that leave the factory as assemblies are built by Ray Baker himself. The man has only so much time. But he does have 20 very com­petent employees who are fully capable of putting out an impressive supply of components and who can perform any ma­chine work necessary to make Buick V-6 parts oval perfect. "We may not be able to build all of the Buick V-6's" says Baker, "but we can sure supply all of the pieces." Clearly, the Buick V-6 is not the engine of today. But it's just a checkered flag away. Looking for a back issue of Stock Car Racing? Click Here!